Refraction was researched by many scientists throughout the ages, and law describing the refraction was discovered separately several times only to be later forgotten. Now it is named after a Dutch astronomer and mathematician, Willebrord Snellius, although - for historical reasons - in some countries it is known as Snell-Descartes law (or even just Descartes law). 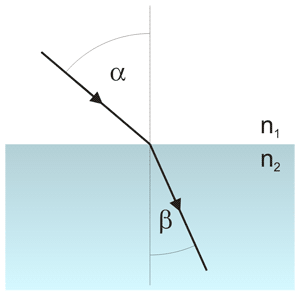 Light refraction - incident (α) and refracted (β) rays, at the boundary between n1 and n2 media. That meant he didn't need a specific constant for each pair of substances, rather he could assing a single number to each substance, call it a refractive index - and use it to calculate characteristic of each boundary. where both indices can be taken from refractive indices table. Snell's law is not limited to light, but describes refraction of any waves travelling through any media. We should also not forget about fact that (as it was explained on the refraction page) refracted angle depends on the light speed, which is in turn function of wavelength - so values of indices are a function of wavelength as well. This site is in construction. More to come. Page was last modified on March 17 2011, 00:00:01.